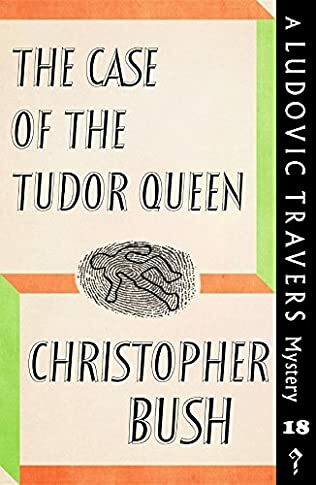 The Case of the Tudor Queen by Christopher Bush – Is Ludovic Travers beaten by this case? This book is the eighteenth Ludovic Travers Mystery, originally published in 1938, now reprinted by the excellent Dean Street Press, which means that this complex tale is very easy to obtain. As to be expected, this is a clever, complex murder mystery in which much is set up for the unwary, and for a large amount of the book the vital information for Travers’ breakthrough is missing. He is ever present, but this seems to be a double death without any certainties but a lot of dead ends. Travers, Wharton and the other investigators have certainly met their match in a case which threatens to defeat even their combined forces. This is a case with high drama, deliberate misdirection and haunting images, as well as a solution that is separate in time and space. Travers and his ever faithful manservant, Palmer, are giving a lift to Superintendent George Wharton in “the Rolls” through the countryside when they come across a young woman walking along in strange circumstances. It turns out that she is a servant of an actress who has failed to turn up at her country cottage, along with her handyman who also appears to have disappeared. As the gentlemen drive into London in an effort to solve the puzzle of a woman who has left her immediate effects behind, they open up the town house to discover the body of Ward, the servant, in the kitchen clutching a glass. A more graphic horror is to be found upstairs as the body of Mary Legreye is found in an eerie echo of her greatest role. Wharton attempts to charm, threaten and generally discover what all the contacts of the unfortunate pair have to say on their whereabouts at the time of the deaths. Could this be the case that defies the combined resources of Travers, Palmer, Wharton, Norris and Lewis? The solution is impossible to foresee, yet manages to be credible. One of the most significant things about many of Bush’s Travers books is the breaking of alibis, and in this novel the alibi of everyone seems unbreakable. This novel seems to represent defeat for the crime cracking team, and the solution is extremely elegant. I am still not convinced that Bush was an accurate writer of female characters, but this is a minor quibble with such a well written tale. Motoring enthusiasts may be intrigued by the details of this book, as well as Travers’ Rolls, and the clues which emerge are well managed gathering together so many seemingly mixed elements. The descriptions are as always well managed, combing a haunting image with more technical details well. As always it is difficult to write an effective review without giving too much away, but this is a book of its time in a sunny pre -war way, as well as being a mystery which has stood the test of time well. The good news is that there is another ten of Christopher Bush novels being reprinted and made available through Dean Street Press on 2nd July. This brings the number available up to 30, and these novels are definitely addictive (you have been warned). I am especially looking forward to this group as they are the wartime novels, and as readers of this blog will know I’m a great fan of novels written actually during the Second World War. (See the Angela Thirkell novels for example). Persephone Books have a box set of their six novels in this category, and they can easily be identified on their brilliant website here http://www.persephonebooks.co.uk/grey-books-52/wwii/ (where they have more than six…). Happy reading to come!